a 2.3 acre fully landscaped rural site just north of Oak Harbor.The old double-wide mobile home is light, large, and well-kept. It sits on the edge of the site, with the main portion of the grounds behind. In this scene, the orchard is to the left with apple, pear, plum and cherry trees. 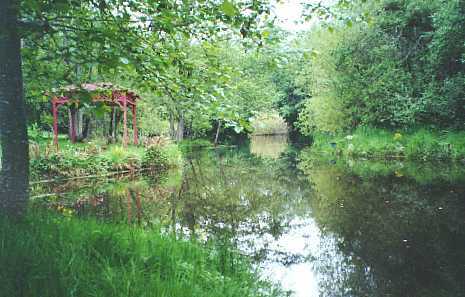 A one-acre pond is situated behind and to the left of the orchard, and wraps around behind the grounds. (45K) The double garage has a full-width family room at the end nearest the house. Between the garage and house a connecting deck contains a party deck and hot tub. Covered decks extend along the garage and the house. 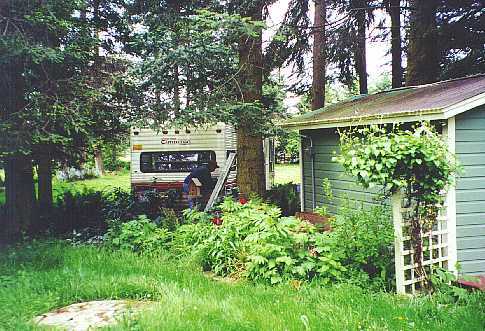 (53K) This 8' x 28' travel trailer serves as the guest quarters, and doubles as "owners' quarters" while we have the property rented to NAS Whidbey families. (50K) The bridges link the island and hillocks (left) with the house grounds and gazebo (right). 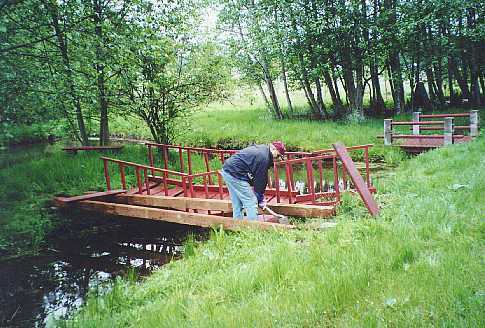 The near bridge goes to a small island in the pond. The far bridge goes to the hillock area. (54K) South end of the property, adjacent to the "community" 5-acre parcel (foreground, and extending behind the camera). 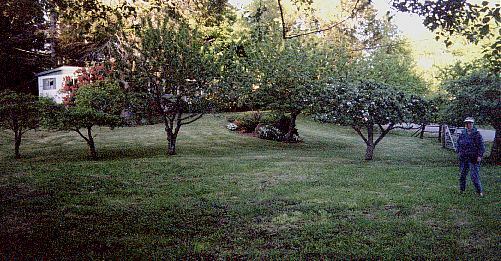 Old pear and apple trees are planted in a row along the property line. The master bedroom end of the mobile home is seen at the left. The lane behind Marcia is "Lefty Lane" which dead ends in a culdesac just to the right. 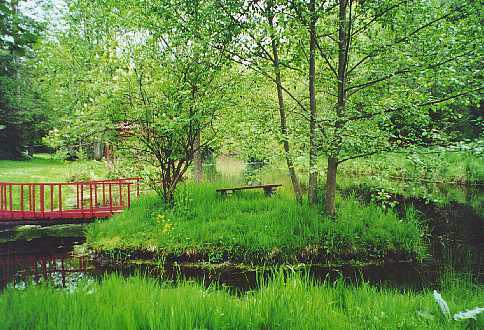 (40K) This view is behind the house, from the rear deck, looking toward the pond.One edge of the pond is just visible at the base of the trees. 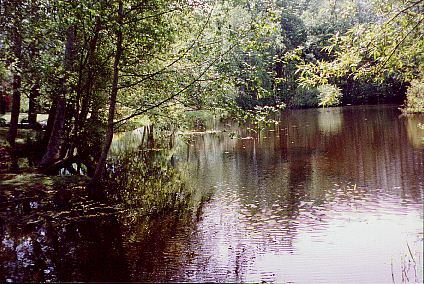 (49K) This is the one-acre pond, looking toward the dam end. The photo is taken from the "island" across the pond extension that wraps around behind the house and grounds. 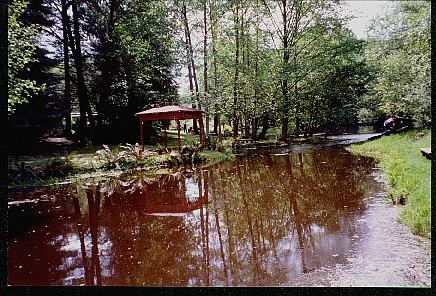 (53K) This is the pond "extension" which lies behind the house. The island and hillocks are to the right; the gazebo is part of the grounds behind the house. 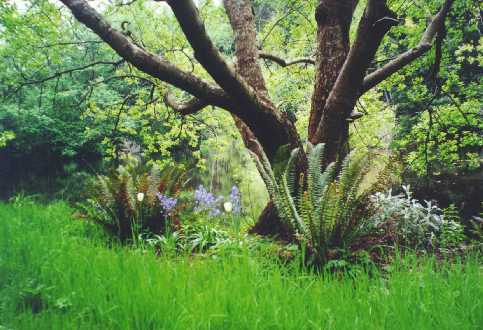 (30K) The old alder and clumps of sword ferns, with flowers at the edge of the pond. 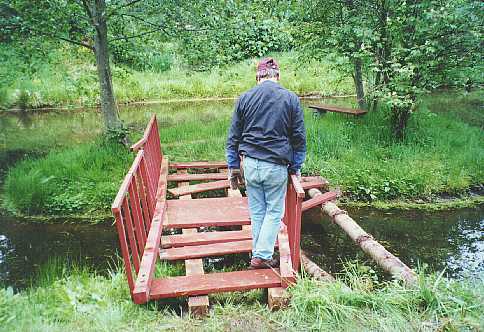 (38K) The foot bridge to the island was originally built on two alder logs. One rotted through and collapsed. Time to rebuild. (31K) A pair of pressure-treated 6 x 6 beams replaces the poor choice of alder logs. Now to shift the bridge deck and rails to the new beams. 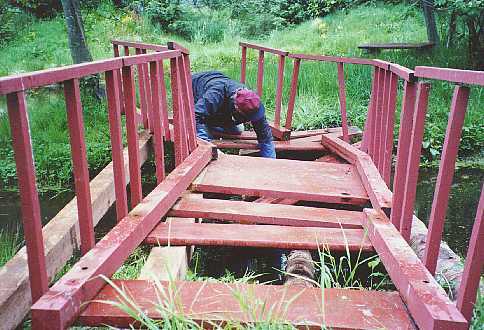 (35K) Allen pulled the deck spikes and dragged the deck assemblies across to the new beams. 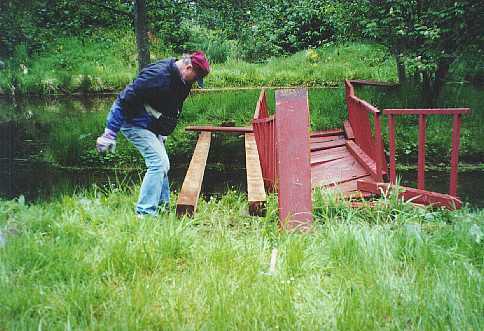 (39K) Most of the deck boards had to be removed. The remaining framework is centered over the beams. 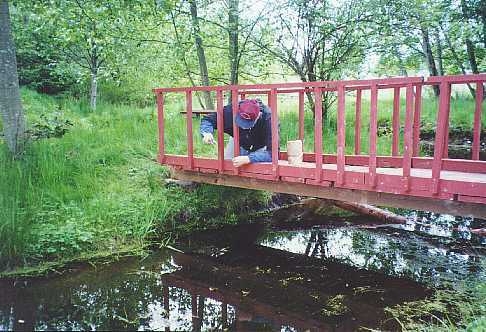 (38K) The deck has been squared and secured, and the railing supports are put back in place. 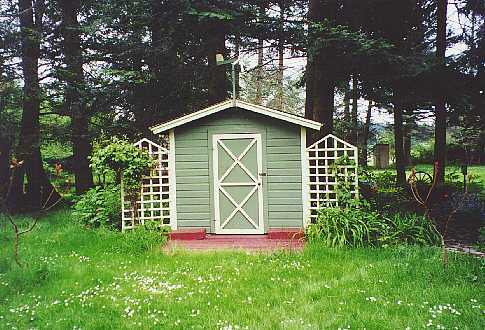 (39K) The back yard features this one-room former toolshed now converted into a guest bedroom or bunkhouse. The former owners' granddaughter had her bedroom here. 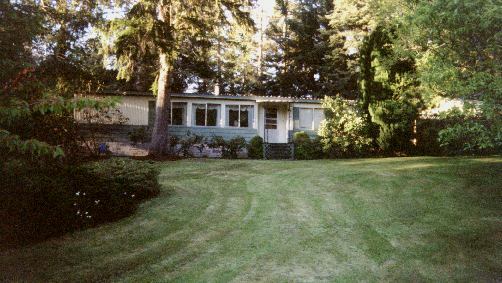 (43K) The "owner's quarters" behind the bunkhouse. (41K) The little island with the red bridge. Grandfather Allen "Graybyrd" features this island in a children's story. 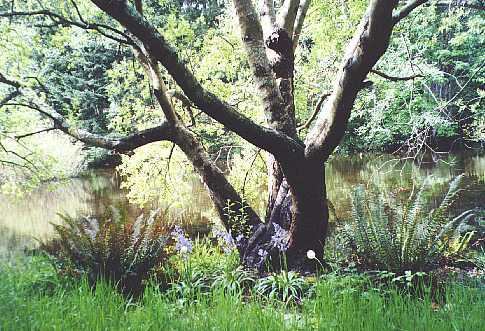 (45K) The ancient alder at the pond's edge, with sword ferns and flowers around the base. 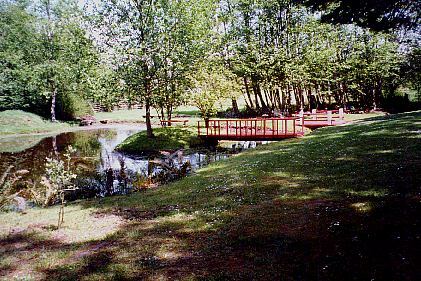 (26K) The 'channel' leading into the pond, with the gazebo. 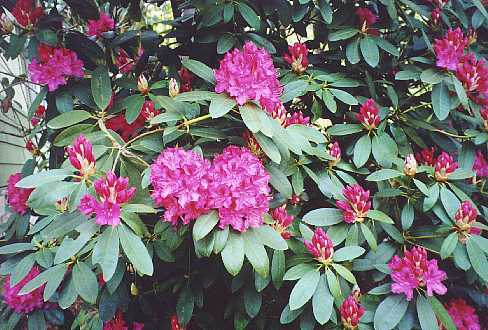 (38K) Rhododendrens in bloom on the MistyIsle grounds. 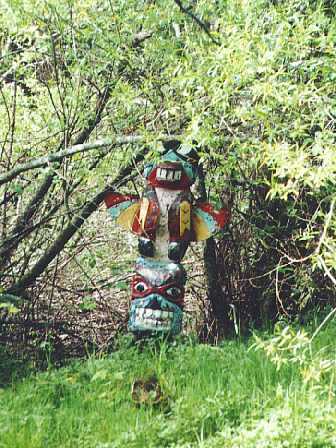 (38K) This small totem pole lives half hidden in the willows across the pond inlet on a grassy bank.